There are over eight lakh practising lawyers in India?? ?after the United States, our country has the second largest legal profession in the world. 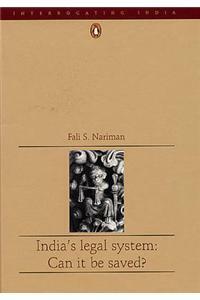 But how are lawyers and the judicial system in India perceived today? It is no secret that the very thought of facing the courts in India leaves the common man with a sense of dread and despair; cases drag on interminably, and justice sometimes seems like an afterthought. Who or what is responsible for this situation? Where have we lost our way? It is at times good to see ourselves as others see us, and the picture is not a very flattering one, argues Fali S. Nariman, renowned constitutional expert, practising lawyer and president of the Bar Association of India. In this frank and thought-provoking book he realistically appraises the performance of those in the profession and what they need to do in the years ahead, and addresses some home truths about our country?? ?s legal system.